Monk's Fisherhouse - ireland-picsandimagess Webseite! von den Mönchen des Klosters Cong genutzt, um die Aufgabe des Fische Fangens einfacher zu gestalten. 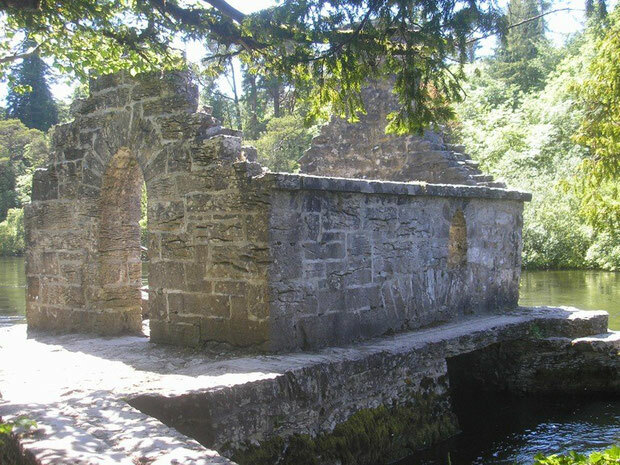 Fish was a staple in the diet of a medieval monastery, and this small building, probably built in the 15th or 16th century, is believed to have been used by the monks of Cong to make the task of catching fish a little easier. It is built on a platform of stones over a small archwhich allows water from the river to flow underneath the floor. A trapdoor in the floor may have been used for a net, and monks could sit by the small fireplace in cold weather waiting for their catch. It is said that a line was connected from the fishing house to a bell in the monastery kitchen to let the cook know that there was fresh fish available.